As one of the oldest instruments still in use, the organ has a long and rich history. E & GG Hood and Hastings were the premier organ builders of the 19th century. As the United States expanded and matured, it joined European nations in its embrace of new technologies, making full use of mechanical and manufacturing advances which characterize the Industrial revolution and the rapidly growing city of Fitchburg. These changes in society affected the business of building organs, and we see the results of this change today with many firms still devoted to the repair and reproduction of pipe organs. 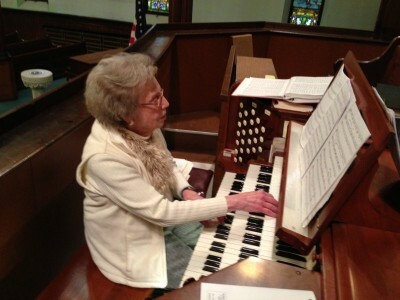 Many of the organs built in the mid to late 19th century are still in use in Americas churches today. There are over 100 in Massachusetts alone, and we here at Rollstone are fortunate to be the owners of one of them. Our Hook and Hastings three manual organ has been modified significantly since its installation, most notably by introduction of the electric action. Most of these modifications took place between 1920 and 1993. The Hood and Hastings Organ in Rollstone Congregational Church has rendered service to the Church and community for over 135 years. It has become part of the foundation and fabric of Rollstone since its installation. Historians recognize it as one of the finest examples of late 19th century American organs. This irreplaceable instrument has been heard in over 7000 Sunday Services, where it has led worshipers through joy and sadness, war and peace. Rollstone Church takes pride in its music and has had a dedicated fund special fund for the repair and restoration of this fine organ. We wish at this time to thank anyone who has contributed to this project.